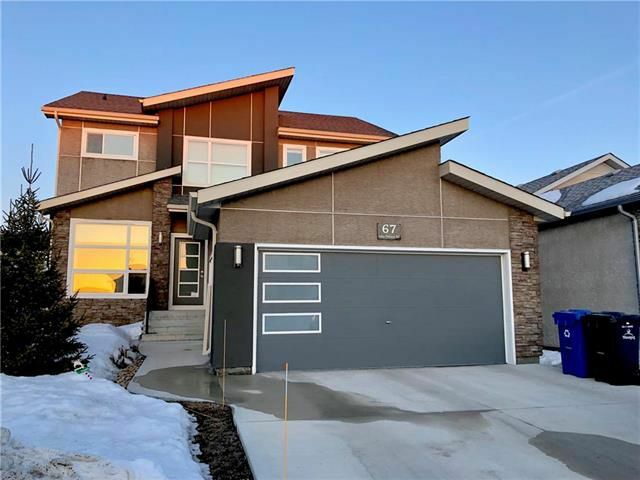 Beautiful former showhome on nice street in Sage Creek. Short walk to the school. 1984sf with 3 bedrooms plus loft space on 2nd floor. Lovely open main floor plan with front den/dining area and large great room/eating area and kitchen space at the rear separated by a feature wall/fireplace. Kitchen features quartz countertops, tiled backsplashes and stainless steel appliances. Nice mudroom off the garage leads into walk-through butler's pantry. Master ensuite features double sinks and a large tiled shower. Double attached garage, deck in the back as well as a patio. Finished basement with additional bathroom.